Berkley have earned the reputation for producing the best artificial baits on the market. Available in various colours, scents and shapes, Berkley Powerbait can be used for a multitude of fishing situations and baiting applications. In addition, Berkley Gulp has a range which imitate real baits including Earthworm, Honey Worm, Maggots, Bloodworm and Corn. Berkley baits deliver an unbelievable artificial scent which tastes like real food to fish, so once the bait hits the water, in instantly attracts fish from everywhere. Simply mould some dough to your hook and wait for the takes to come thick and fast. Using natural Earthworm is highly effective, however Berkley Earthworms, infused with Gulp's irresistible attractants, multiply your chances of hook-up massively! So what are you waiting for? 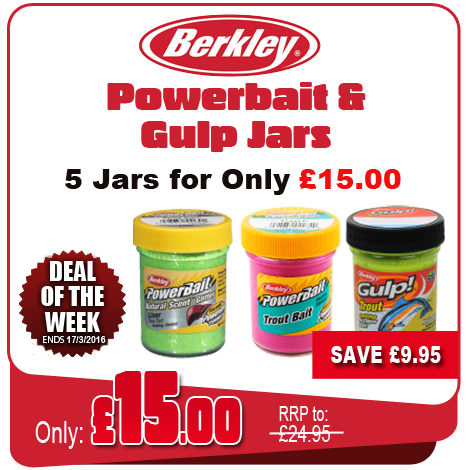 Experience the amazing attraction from Berkley Powerbait or Gulp baits for yourself and take advantage of this fantastic 5 for £15.00 offer.